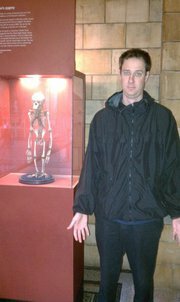 Brian posing next to a skeleton at a museum in London, during a stopover visit from his trip to India in February of 2011. His last profile picture on Facebook. 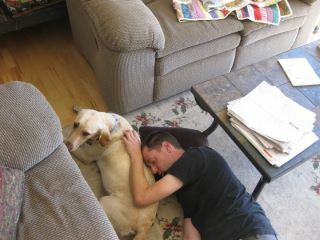 Brian and Pia, his sister. 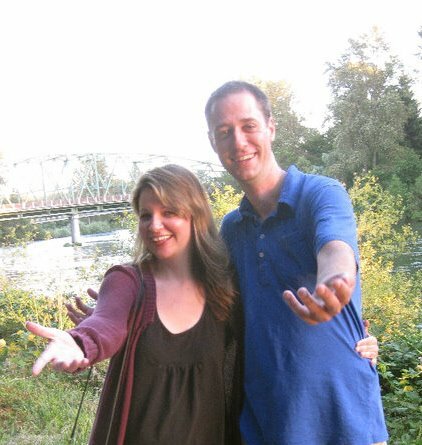 He and Janet had visited her in Eugene, Oregon, and this picture shows the Willamette Bridge behind them, the same bridge where they all danced on the very same night. Our last view of Brian is this and the next one, Brian and Butters down on the floor at our cottage in Port Orford, taking a nap after July 4th parade and lunch in Port Orford. We had never seen him happier. I can't imagine what you go through day in day out. I admire you so much.